Don't let Mother's Day sneak up on you! Last week I was asked if I could do coasters with both resin and concrete. I decided to do a Mother's Day coaster to try it out. - Resin - I used Easy Cast, but Envirotex Lite will work too. 1. Mix your concrete/cement according to the package directions. Mine uses a 4 to 1 ratio - four parts concrete mix to one part water, but the ratios can be different for different products, so be sure you check yours. 2. Pour the concrete into the mold. Tap it on the table to help release air bubbles and level out the surface. 3. Let it sit for a while - the time will vary product to product. Make sure a toothpick can stay standing before moving onto the next step. 4. Begin to stamp the concrete. I stamped Love You Mom because Mother’s Day is coming up. I tried to be keep the lettering centered, by starting in the middle. I ran out of room for the E, so I put it at a little angle. I also stamped a flower and a heart. 5. Once the concrete set, I took a stencil brush and dipped it in light blue paint. I wanted to do a dry brush over the concrete. 6. I then took other colors on a skewer and dripped it into the letters. I used the back of the skewer to add polka dots. 7. Let everything dry overnight. 8. The next morning, I mixed my resin. I used the Easy Cast, but Envirotex Lite would work too. And I poured it over the concrete. I used a skewer stick to help force out some of the bubbles that were stuck in the letters. Remember, concrete is a porous surface and you will likely get more bubbles than you expect, so keep going back for a while with your lighter to pop them. 9. Let it cure for a minimum of 12 hours before unmolding. That’s it! 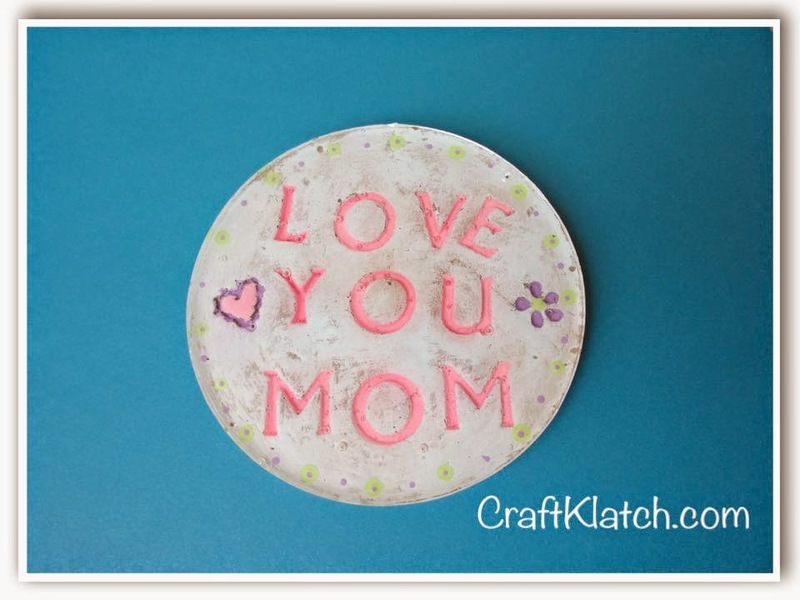 Now you have a beautiful coaster for your beautiful mom!! Remember every Friday is Another Coaster Friday. And I always have a new craft on Mondays! Thanks for stopping by! Happy Mother’s Day and Happy Crafting and stay safe!! Such fun making these with the kids.........I have several in my garden and some even have jewels and dates on them. Thank you for sharing with the Clever Chicks Blog Hop! I hope you’ll join us again next week!